There are numerous paintings created hundreds of years ago with enigmatic and unexplained objects incorporated by artists, but this painting from the 15th century is considered as one of the most incredible paintings from the past which clearly depicts a UFO. It seems that in the distant past, people witnessed an incredible aerial phenomenon which they could not explain, but considered them important enough to portray them in some of the most important paintings created in the last 500 years. A painting called “The Madonna with Saint Giovannino”, created in the 15th century is without a doubt, one of the most enigmatic ancient paintings ever created by man. It is an ancient painting that according to many, depicts a mysterious Disc-shaped UFO hovering in the sky, and is considered by many people as the ultimate vehicle that during millennia, mankind was visited by highly advanced alien civilizations. The enigmatic painting was created Domenico Ghirlandaio (1449-1494) and is currently located on display at the Loeser collection in the Palazzo Vecchio. 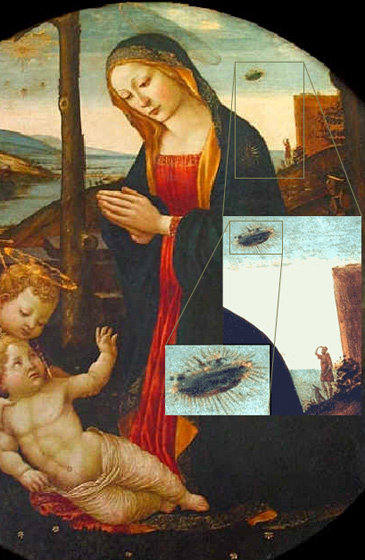 In the mysterious painting we can clearly see that above Mary’s right shoulder the artists painted an enigmatic UFO, and below this incredible scene, we can observe a man clearly looking at the mysterious object in the sky. Located on the right side of the painting, we see a man holding his right arm above his eyes with which the artist made sure to send a message that this object was very bright. To the left of the image in the upper corner, we can see an object that looks like the sun. This means that the artist painted this disk shaped object, giving it a shiny detail and he made sure to illustrate it to the right of the sun so we know this bright object cannot be confused for the sun, this disk shaped object does not look like your ordinary cloud, so if it is not the sun nor a cloud what could it possibly be? Ufologists argue that this painting clearly indicates that hundreds of years ago, ancient mankind witnessed the mysterious phenomenon in the sky which they could not explain. This is why similar UFO’s can be seen in other paintings ranging from 1400’s to the late nineteenth century. But just like “The Madonna with Saint Giovannino , there are other extremely strange paintings all around the world. Another incredible example is without a doubt located at the Visoki Dečani monastery in Kosovo: The Crucifixion of Christ. Another painting that we find extremely interesting is “The Annunciation” painted by Carlo Crivelli. In his painting “The Annunciation” there are several objects that stand out from the rest of this extremely detailed piece of art. One object, in particular, can be seen in the sky out of which a mysterious beam of light is emerging from. Is it possible that paintings as the Madonna with Saint Giovannino, The Crucifixion of Christ and The Annunciation are in fact evidence of otherworldly visitations? Is it possible that in the distant past, artists observed these mysterious objects in the skies, and decided the include them in paintings that today are considered of extreme value? Interestingly, thousands of years before these paintings were created, ancient mankind depicted in caves all around the world, similar objects with humanoid figures that remain unexplained by mainstream scholars. Are these paintings the ultimate evidence of otherworldly visitations? And if so, how much can they influence religion? Let us know what you think and post your comments below.